Action Type: Side by Side, Side-Lock, Double Non-Selective Trigger Shotgun with Ejectors. This shotgun has cocking indicators, but the indicator markings have worn off, presenting featureless pin hads in the lockplates which rotate when the triggers are pulled and when the gun is cocked. Markings: The top of the barrel rib is marked “STEPHEN GRANT & SONS, 67 St. JAMES’S STREET, LONDON”. The bottom of each barrel is marked “7911” and with a London proof mark. Each barrel flat is marked “12”, crown over “V”, crown over “GP”, “12 / C” in diamond, “CHOKE”, sword in arm over “NP”, “NITRO PROOF” and “1 1/8”. The top of the forend iron is marked “7911”. Each side of the water table is marked “7911” and crown over “V”. Each sideplate is marked “STEPHEN GRANT & SONS.”. The sideplates, receiver, trigger plate and guard have decorative scroll engraving. The bottom tang is marked “7911”. Choke:Left: Modified, Right: Improved Cylinder, both fixed. Sights / Optics: This shotgun is mounted with a silver colored bead at the front of the rib. Weight: 6 lb., 8.7 oz. Stock Configuration & Condition: The stocks are two piece fine-checkered walnut with splinter forend, straight grip, straight comb, and solid brown rubber buttpad. The forend has an Anson-style push-button release. The forend has a repaired chip-loss at the left edge toward the front. There is a very short, thin crack at the rear edge of the right lockplate and a shorter crack at the rear tip of the top tang. Otherwise, there are only some scattered light compressions, the most notable at the rear of the forend. The checkering is sharp. The wood to metal fit is excellent. The LOP measures 14 3/4″ and 13 3/4″ from the fronts of the triggers to the back of the recoil pad, 13 3/4″ and 12 3/4″ to the back of the wood. Drop at comb measures approximately 1 1/2″, drop at heel 2 1/4″. The pad has hardened slightly with age showing light wear, in about Very Good condition. Overall, the stocks are in about Very Good condition. Bore Condition: The bores are bright. There is no erosion. Overall Condition: This shotgun retains about 96% of its metal finish. The barrels have some scattered light marks and spots of light wear on each side at the breech. The receiver and lockplates show no notable wear or damage, only light handling marks. The bottom tang has light handling wear and scattered light surface oxidation. The cocking indicators have lost their reference marks, likely originally gold arrows, but they still turn and would function properly with new markings applied. The screw heads range from sharp to lightly tool marked with strong slots. The markings are clear. Overall, this shotgun rates in about Fine condition. Mechanics: The action functions correctly. The shotgun has double non-selective triggers and a selective ejector; the action closes tightly with no movement. The cocking indicators function correctly, but the indicator markings have worn off. We have not fired this shotgun. As with all used firearms, a thorough cleaning may be necessary to meet your maintenance standards. 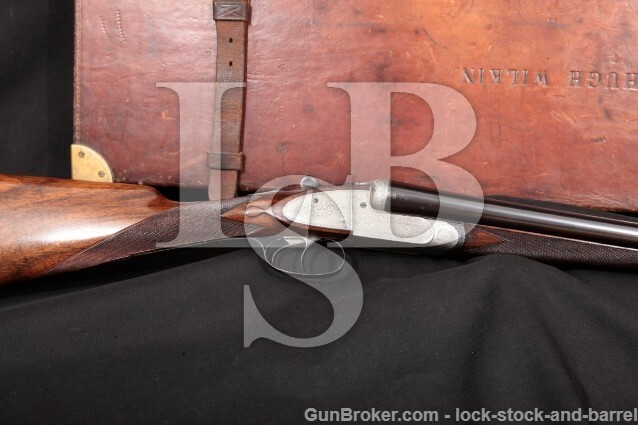 Box, Paperwork & Accessories: This shotgun comes in a leather-bound hard-sided carry case with brass bolsters at the corners, English-style straps with “HUGH WILKIN” marked on the outside of the lid and a Stephen Grant & Sons maker’s label on the inside. The exterior of the case has moderate wear with scattered scratches, scuffs and compressions. The interior has light-moderate wear from its contents with scattered discoloration from age and oil and some spots worn through the felt lining. Stitching is intact and the straps show moderate use wear. Overall, the case is in about Good-Very Good condition. Stephen Grant was a British gunsmith who became quite successful in the world of fine British guns in the late 19th and early 20th centuries. He worked with Boss in London, which would go on to be one of the earliest makers of a breech-loading over/under double gun. Grant went into business for himself after Boss died in 1865. His company would go on to partner with several other makers and his sons joined the company as they became old enough. This example was produced between 1904 and 1925 and is a beautiful specimen with nice engraving on its coin finished receiver, strong ejectors, cocking indicators and beautiful checkered walnut stocks. The action still locks up tight, the bores are fantastic and everything functions correctly, though the cocking indicators need new indicator markings. This is a finely crafted British gun that would be at home in any collection and comes with a nice storage/transport case as well. Please see our pictures and good luck! We have measured the barrel wall thickness for each bore, with minimum thickness approximately 0.006″ on the left barrel approximately 7-8″ from the muzzle and approximately .007″ at the same point on the right barrel.